Here comes the empath, the healer. An empath has the ability to sense and absorb other people’s pain and often takes it on as though it were their own. If an empath is not consciously aware of boundaries and does not understand how to protect themselves, they will very easily and very quickly bond with the narcissist in order to try to fix and repair any damage and attempt to eradicate all their pain. However we allow ourselves to be treated as a result of our own choices. If an empath chooses to stay in a relationship with a narcissist and refuses to take responsibility for the dynamic, they are choosing at some level what they believe they are worth on the inside. An empath cannot let their self-worth be determined by a narcissist. It is imperative they trust and believe in themselves enough to recognise that they are not deserving the words and actions the narcissist delivers and to look for an escape. In an empath’s eyes, all they searched and looked for was someone to take care of and love and to "ultimately fix". That is where the trouble begins and that is the most profound part of this that an empath must realise. We are not here to fix anyone. We cannot fix anyone. Everyone is responsible for and capable of fixing themselves, but only if they choose to. The more an empath can learn about the personality of a narcissist, the sooner they will spot one and the less chance they have of developing a relationship with one. If a relationship is already underway, it is never too late to seek help, seek understanding and knowledge and to dig deep into one’s soul and recognise our own strengths and capabilities and do everything we can to build the courage and confidence to see it for what it is and walk away—for good. 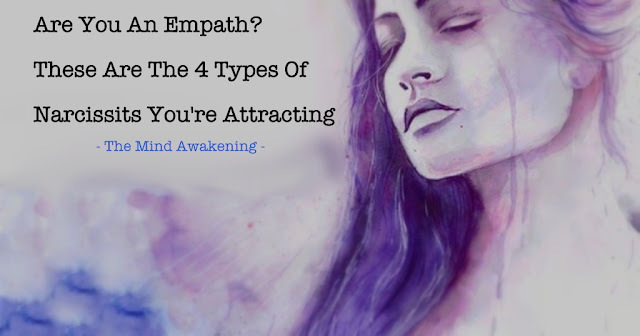 An empath is authentic and is desperate to live true to their soul’s purpose and will very likely find the whole relationship a huge lesson, a dodged bullet and a painful awakening. While I found this article to be insightful, I feel the title is misleading. You talk about the dynamics between the narc and empath but no where do you talk about different types of narcissists that we attract.